Re: 4 Years of - Trump Did WHAT? Are you trying to complete with Flossy for number of redundant threads? Thanks - and that's a funny thread.. Bill Maher rules..
Makes you wonder if Trump understood all the fine-print in the contract before he signed on. Option 'B' would be some foreign Government is sticking their fingers in where they don't belong. Somebody should investigate that angle. Walnut, if you know something and aren't telling the Law that is an act of treason. Last edited by MHz; Sep 30th, 2018 at 08:20 PM..
Poor MHz- his miserable Muslim propaganda has been exposed for the hysterical anti western and anti white garbage that it is!!!!!!!!! His only supporters are other Muslims and assorts minority flakes who hate whites!!!!!!!!!!!!!!!!!!!!!!!!!! Trump has begun the battle to take back democracy from influence of Antifa dictators!!!!!!!!!!!!!!!!!!!!!!!!!!!!!!!! So many decades of LIE-beral propaganda have created several generations of LOONS who assume all problems of their lives are the fault of others!!!!!!!!!!!!!!!!!!!!!! One has only to look at Socialist basket case Venezuela or look a few years back to what it was like to live in socialist Argentina to recognize what a hell hole Antifa would make of Canada if we gave them and their LIE-beral allies half a chance!!!!!!!!!!!!!! Antifa has adopted the ways of the jihadis by resorting to intimidation and violence. A participant in an August 11 “anti-hate” rally displayed what must be called raw hatred toward Toronto Sun photographer Stan Behal, who was simply doing his job. Antifa of course represents the worst in the ultra-liberal left, having justified its actions — including its violence — with the argument that racist violence can be countered only with violence. In the process it seems to have forgotten that even in the face of terrible oppression, any movement that can lay claim to ethical purity has always been non-violent, such as Gandhi’s in India and Martin Luther King’s in the American South. Violence is counterproductive: even a few antisocial actions will always overshadow any organization’s peaceful and constructive initiatives. (Antifa takes virtually all its inspirations and motivations from the old Soviet Socialist model- and will therefore recreate the Soviet mess- if they get a chance! Not only did Antifa attack journalists in Toronto, but it also held rallies to protest racism in North America against Unite the Right 2 in Charlottesville and Washington, DC. It is acceptable — even noble — to promote one’s views by demonstrating. But what is ignoble is that its members resorted to the same vicious tactics for which it blames the right. Members of the movement attacked journalists and even the police in those cities. But more profoundly, Antifa seems to have lost track of why certain religious and cultural practices are challenged by journalists and some participants in public discourse. These practices are questioned because they represent the very antithesis of the liberalism Antifa purports to endorse. Liberalism acknowledges the equality and the dignity of all human beings regardless of race and gender. Antifa should know this but, like most so-called liberals, their opinions are based more on hearsay than on fact. A sort of herd mentality has developed that ignores sometimes complex facts. In Toronto the rally focused specifically on Islamophobia. This is a provocative term that is questionable from the outset, as it encompasses many facets of Islam. People should be free to dislike aspects of any religion or philosophy without enduring such a label. Most Muslims in this country are no doubt law-abiding and peaceful and have as little to do with sharia as other Canadians. However, the lack of knowledge with which Antifa operates makes it ignore the fact that though Muslim belief is diverse, its Islamist faction pursues a set agenda: establishing parts of oppressive sharia in our tolerant nation. The herd mentality of Antifa prevents it from seeing these important differences among the Muslim population. The rally was led by well-known activist Azeezah Kanji, who has on occasion justified sharia law in her past writings. Sharia proposes an Islamic state which would not accord full citizenship rights to religious minorities or full equality to women. It would segregate and marginalize women and justify practices like polygamy. It would even pass laws to label any questioning of these measures as an act of blasphemy. Antifa activists have become “useful idiots”, ironically doing the dirty work of fascists who seek a repressive state where any dissent would be brutally punished. These are the very tactics adopted by Islamic radicals when they fear criticism of their heinous agenda or any perceived insults to Islam. Antifa and other self-professed liberals need to do a bit of research, review their agenda and particularly their strategies and get a more nuanced understanding of who needs protection from what. 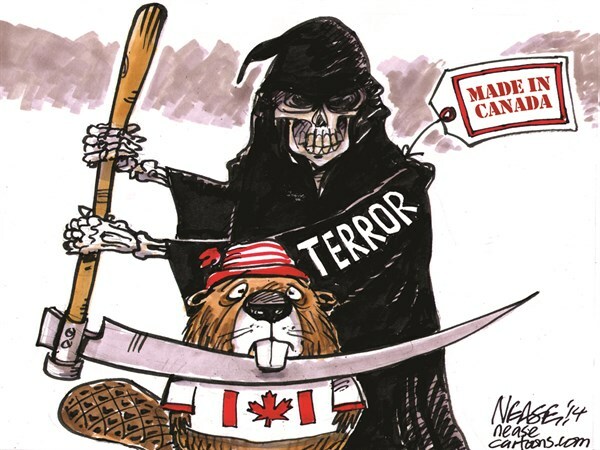 MegaBUTTHurtz still here.. thought the FBI would have snapped him up already..
Yeah- the cartoonist Nease usually draws stuff with s humorous edge ........this one about terror is too close to TRUTH to be funny!!!!!!!!!!!!!!! Just another thing to add to the list of B.S. stuff LIE-berals have dumped on us!!!!!!!!!!!!!!!!!!!!!!!!!!!!!!! Be careful, a couple of months ago I overheard somebody saying somebody would be showing up in a couple of months to clean the place up so be careful where you step. With any luck one of the White Helmets group that is being relocated will move into your neighborhood. I hear they are trained in first aid and sorcery. If they are on my tail that is also why I'm still free. Must be a sign I'm destined to haunt these halls till time is no more. Still got the black truck? Poor MHz........you are still free because most people assume you are a harmless fool! But dont worry- as LIE-berals drive us ever deeper into fiscal disaster and political dictatorship- ever more people become alerted to the crap that people like you are spewing daily!!!!!!!!!!!!!!!!!!! All LIE-beral policy is failing and LIE-berals are lashing themselves into a frenzy trying to deny it!!!!!!!!!!!!!!!!!!!! Migrant justice group 'No One Is Illegal' protested the Ontario Government for racial profiling by the OPP and endless detentions and deportations. They had their rally in downtown Toronto and marched to the Ministry of Transportation offices at Queen's Park, on Monday August 18, 2014. Stan Behal/Toronto Sun. “Using its legislated inquiry powers under section 31 of Ontario’s Human Rights Code, the OHRC has called for the TPS, the Toronto Police Services Board and the Special Investigations Unit to provide a wide range of data to determine exactly how and where racial profiling operates in law enforcement,” said a OHRC news release Thursday. Mike McCormack, president of the Toronto Police Association, talks to media at Toronto Police Service headquarters in Toronto, Ont. on Friday February 10, 2017. It was a damning rebuke of the TPS. But it did seem odd this inquiry seems to already know the answer before asking the question. “The fix is in and without a fair process, the chief commissioner should step down,” said McCormack.